Holding an advantageous position, the hotel is not only an ideal beach resort for relaxing, enjoying the sun and the sea, but it is also a perfect starting place for visiting most of the sights of Crete, a wonderful island with great history. 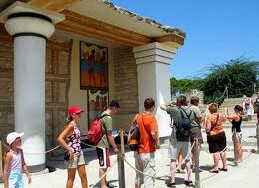 There are several areas with ancient ruins from the Minoan era like Knossos, Festos, Gortys, Malia and Zakros. In the city of Heraklion, only 15 Km away, you can visit the Archeological Museum, the Historical Museum and the Natural History Museum, as well as the Venetian era castle ’Koules’ in the harbor and the fortification walls surrounding the area of the old city ’Candia’. CretAquarium, part of the largest marine research and technology complex in the Mediterranean, is also just 1.5 Km far away from the hotel. For the golf funs, the Crete Golf Club is also 13 Km away. You can make several excursions like visiting the Samaria Gorge, the Palm Beach of Vai, Dikteon Antron (Cave), the island of Spinalonga, or even making a daily trip to the island of Dia or the volcanic island of Santorini. You may also visit several traditional Cretan villages like Anogia or Sfakia.